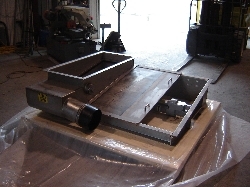 Clearwater Separation Systems has developed proprietary custom designed trailer mounted auger systems and solids pumping systems, including hazardous waste handling and disposal systems. In our mobile de-watering trailers, the auger removes solids from under the centrifuge; discharging into a slide that feeds the exterior boom auger. The slide gate is located under the auger. Seal water passes through the auger into the sump tank. The Slide Gate is mounted below the Auger, eliminating the need for reversing starters and flush water. Designed for diversion of liquid discharge from the centrifuge solids discharge on start-up above solids handling/storage. The gate is designed for diversion only and does not hold liquid. The Boom Auger reaches a height of 12', which allows loading of end dump trailers and dump trucks. It folds away easily for transportation with a winch and pulley system.